It’s Fashion Week in New York City, which inspired Buddy to look at fashionable footwear for pet owners. He spotted this pair online, and while they are inspired by cats, he thinks they are also ideal for owners of dogs that might need a little extra incentive to, well, heel more readily while out ona walk. Hopefully nipping won’t ensue! 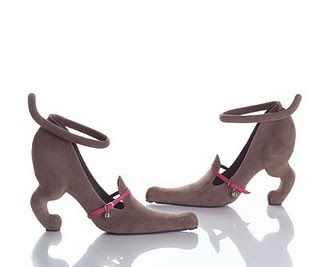 Designer Kobi Levy also has a pair of hound heels too for those who want to feel like they’re walking dogs all the time! This entry was posted on Monday, September 12th, 2011 at 11:47 AM. It is filed under Blog. You can follow any responses to this entry through the RSS 2.0 feed.